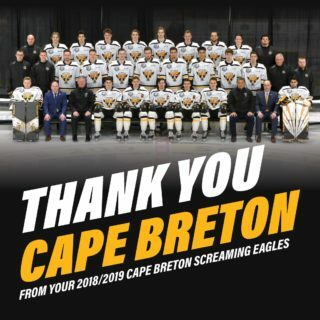 As many NHL rookie training camps are kicking off, the Cape Breton Screaming Eagles are well represented across North America. In total six Screaming Eagles players will be in attendance at rookie camps, most of whom are seeing tournament action this weekend. Defensemen Leon Gawanke is one Screaming Eagle player who will be attending his second NHL rookie training camp. The 19 year old blueliner was drafted by Winnipeg in round five (#136) in 2017. Last season the German rearguard compiled 32 points in 54 games in his second QMJHL season. Throughout his junior career he has represented Germany twice at the Division 1A World Junior championship. This weekend Gawanke and his Jets teammates are playing at the Young Stars Classic in Penticton, British Columbia, against the Vancouver Canucks, the University of Alberta and the University of British Columbia. This past June saw two of Gawanke’s teammates have their name called in the sixth round of the NHL draft, and both will partake in NHL rookie tournament action this weekend. Goaltender Kevin Mandolese was tabbed by the Ottawa with the 157th pick, and just twelve selections later St. Louis chose forward Mathias Laferrière. 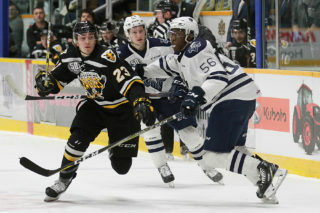 Mandolese is entering his 18 year old season for the Screaming Eagles. In his sophomore campaign he posted a goals against average of 3.46 and a save percentage of 884. The Senators prospect has represented Canada internationally at both the Under 17 and Under 18 levels. This weekend he and the rest of the Ottawa rookies are competing at the NHL Rookie Showdown in Laval, Quebec, against the Montreal Canadiens and Toronto Maple Leafs. Laferrière was chosen by St. Louis following his first full season in the QMJHL. In 2017-18 the Screaming Eagles forward recorded 41 points in 67 games. The Blues draft pick was originally drafted by the Blainville-Boisbriand Armada after winning the MVP award at the Telus Cup (the national midget championship) at just 15 years old. This weekend St. Louis is participating in the eight team 2018 NHL Prospects Tournament in Traverse City, Michigan. 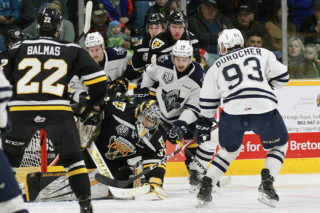 While in Michigan, Laferrière will see some familiar face as a pair of undrafted Screaming Eagles players have earned free agent invitations to NHL rookie camps. Defenseman Adam McCormick is skating for the Dallas Stars while forward Egor Sokolov is suiting up for the Columbus Blue Jackets. In his second QMJHL season, McCormick notched 37 points in 67 contests. He was also named top defenseman at the year end Screaming Eagles award banquet. 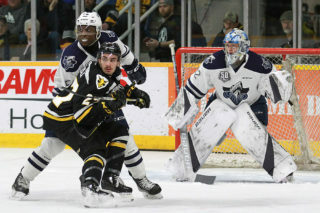 Sokolov made his QMJHL debut in 2018-19, recording 42 points in 64 games and also scoring a goal in the CHL Top Prospects Game. The Russian forward also skated for his country at the Under 18 Ivan Hlinka Tournament in 2017. New Screaming Eagles forward Mitchell Balmas has also earned a free agent invitation to a rookie camp of the Philadelphia Flyers, which begins on September 9th in Vorhees, New Jersey. The Sydney native posted 72 points (including 42 goals) in 68 QMJHL games last year. The now 20 year old winger was a key acquisition at the trading deadline for the Bathurst Titan (from Gatineau), and helped the New Brunswick club win the Memorial Cup. Screaming Eagles players not participating in NHL training camps will make the trek to Charlottetown for an exhibition game against the Islanders on Sunday afternoon at 3 PM. The Screaming Eagles will also open the regular season in Charlottetown on September 21st, and will play their home opener on September 28th against their provincial rival Halifax Mooseheads.